On August 4 2013 the newly elected Iranian president Hassan Rouhani has taken his oaths. A number of experts believe that this pragmatic cleric that has a strong Western background will bring a new spark to the Iranian relationships with the international community, especially on such pressing concerns like the nuclear programme of the Islamic Republic of Iran. 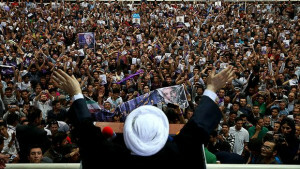 Many observers stress the fact that it was Rouhani who was charged with negotiating the “nuclear problem” with the international community back in 2003. These negotiations resulted in the Iran’s decision to suspend the enrichment programme. Despite the fact that this suspension lasted for two years only, the Western experts seem to be quite optimistic about the newly elected Iranian President. Rouhani seem to be the only hope to put an end to the stalemate in countless rounds of the Iranian negotiations with the “Big Six”. Right after the elections were through the Western media started to distribute the news about the Iranian desire to meet the United States dimplomats at the meeting table tête-à-tête. As a matter of fact Iran hasn’t established the dimplomatic relationship with the United States since the Islamic revolution of 1979. Sometimes, while reading the media, one can run across the statements that it were the United States that would try and reach they respective collegues from Iran. According to the same sources the dimplomats from the both sides meet at a regular basis on the “netural territory” to discsuss the most pressing concerns of the day, espesially the narco traffic and the growth of the Taliban threat in Afghanistan. From a different perspective, Rouhani, despite being a pretty pragmatic person, despite having the Western education up his sleeve, despite having a negotiation experience with the Western crowd, is unable to make the decisive steps towards the liberalization of the Iranian society all by himself. He must, as all of his predecessors did, collate all of his steps with the religious leader of Iran – Ali Khamenei. But there’s a theory supported by a number of experts (the author of this article included) believe that if it wasn’t for the approval of Ali Khamenei, Rouhani could have never been elected. But the newly elected President have all the chances to put an end to the “nuclear face-off” against the West. The Iranians themselves don’t seem to suffer too much from the economical sanctions imposed upon them by the Western powers. The theocratic democracy that is adopted by this country is not a concern for the locals, since they have the truly democratic elections. This fact is admitted by those Western observers that seem to have no sympathy with Iran whatsoever. The only thing that may bother the civilians and the politics of the Islamic Republic of Iran is the Western strive to conduct a regime change in Iran, which is unacceptable for the better part of the Iranian people. But if this issue is taken off the table, the Iranian market will find itself swarming with the Western companies that will eliminate Russian competition in no time. The economics cooperation that must be improved through more contracts signed. The political cooperation that can be strengthen through the enhancement of the cooperation. The settlement of the “Iranian nuclear problem” that can be reached through the discussions with the Western allies. Vladimir Sotnikov, PhD in History, Senior Research Associate at Institute of World Economy and International Relations, exclusively for online magazine “New Eastern Outlook”.